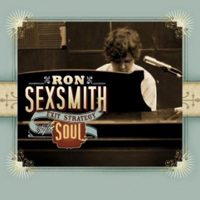 After the brief instrumental prelude of “Spiritude,” Ron Sexsmith begins his tenth album with “This is How I Know,” a humble love letter to the Divine in which he affirms those things in his life that make him sure there is a God. At the top of his list: The “music on the radio” that provided him at an early age with inspiration and escape. Sexsmith’s devoted fans will no doubt smile and nod their heads in agreement– and not just because Sexsmith’s heavenly music itself has probably convinced more than a few listeners that there really must be a God in Heaven. No, it’s a fitting sentiment because there aren’t many singer/songwriters recording today whose work so unashamedly revels in the sheer joy of music itself. Sexsmith’s tools are simple but essential– lyric, melody, voice– and his influences many– Paul McCartney, Harry Nilsson, Bill Withers, Paul Simon, jazz and country, folk and pop– but make no mistake: His is a talent so natural and so effortless that he writes and sings with a voice all his own, with each album he releases feeling like a small, special treasure, a celebration of song itself. It’s no wonder that he counts among his famous fans Elvis Costello, Chris Martin, and even Sir Paul himself. Sexsmith has recently added to this list another famous fan: Nick Lowe, for whom Sexsmith recently opened a series of shows and whose name appears in the thank-you section of Sexsmith’s liner notes to Exit Strategy of the Soul. And it’s surely no surprise to find that the two men admire each other’s work; of all his famous fans, Lowe might be the one who Sexsmith most resembles, not in his actual songwriting so much as the attitude and sensibility he brings to each of his albums. Like Lowe, Sexsmith makes music that is exceedingly warm and inviting, gentle and laid-back in its elegance and modesty, full of humor and heart and easy-going charm. It’s that same sense of modesty and ease, however, that also provides Lowe with his Achilles Heel; the former New Waver has released four albums in a row now that mine the same basic vein of country and R&B, and while they’re fine albums all, a casual listener would be justified in thinking that they all sound pretty much the same. Consistency is both a blessing and a curse, it would seem, and, at his worst, Sexsmith sometimes falls prey to it, cranking out albums (like his last one, Time Being) that inhabit the same familiar crossroad between folk, pop, and rock. It’s a finely-crafted and enjoyable album– all of Sexsmith’s are– but it’s not an album that does much to expand our appreciation for its maker’s art. But what about when he’s at his best? When Sexsmith is really on, he maintains his trademark aw-shucks humility and emphasis on song while pushing his music into exciting new territory, be it in the raw country sounds of Blue Boy or the varied shades and styles of his masterpiece, Retriever. Exit Strategy is an album that belongs squarely in the latter category– and you don’t even have to hear the album to find out why; all of the press materials and early reviews of the album emphasize the fact that producer Martin Terefe (who has worked with Coldplay and also produced Retriever and Cobblestone Runaway) encouraged Sexsmith to move shop to Cuba, where these songs were recorded with the help from a few local brass players. Heck, even the cover photo of Sexsmith tickling the ivories suggests a new direction here; never before has the piano played such a prominent role on any of his albums, replacing his trusty acoustic guitar for at least half of these songs. It probably goes without saying that the resulting album doesn’t resemble Cuban music in the least– that would be too drastic a stylistic shift for a guy like Sexsmith– but it is an uncommonly warm and soulful recording amidst a catalog of albums that are, well, uncommonly warm and soulful. Sexsmith adds Van Morrison to his list of influences with some of the more spirited and upbeat songs, like “Brighter Still” and a rousing version of the song he wrote with Leslie Feist, “Brandy Alexander,” and the record also veers closer to country terrain than any of his albums since Blue Boy, but, by and large, the album’s touchstone is the Retriever standout “Whatever it Takes,” a silky-smooth R&B number that simmers with soul and sets the tone for many of the songs on Exit Strategy. In other words: Sexsmith is getting in touch with his inner Bill Withers like never before. Though the addition of horns suggests an expanded sonic palette, it’s actually a very focused album, not nearly as rich in different textures and styles as Retriever. Indeed, a slight sense of homogeneity might be the album’s shortcoming, but Sexsmith’s writing is so vivid and distinctive that it’s really not a problem. And make no mistake: The horns and the piano aren’t what draw your attention when you put the record in. As always, Sexsmith goes out of his way to serve the songs, keeping the emphasis always on his melodies, his razor-sharp hooks, his lyrics. That’s what makes him a singer/songwriter in the classic sense of the term, and that’s what ultimately makes his music– humble though it may be– remarkable. As on Retriever, Sexsmith places earthly love and delights within the broader context of Divine love– just another example of his natural humility and the elegance of his writing. Sexsmith’s fans will no doubt add this recording to their own lists of God-given delights; warm and inviting, small in scope but large in stature, this is yet another stately, graceful collection of songs from one of the true masters, an album that will be cherished like a close secret to those lucky enough to find it.